Thick and rich with a just the right amount of sweetness, these baked beans are a perfect side dish for whatever you cook up for the Memorial Day weekend. 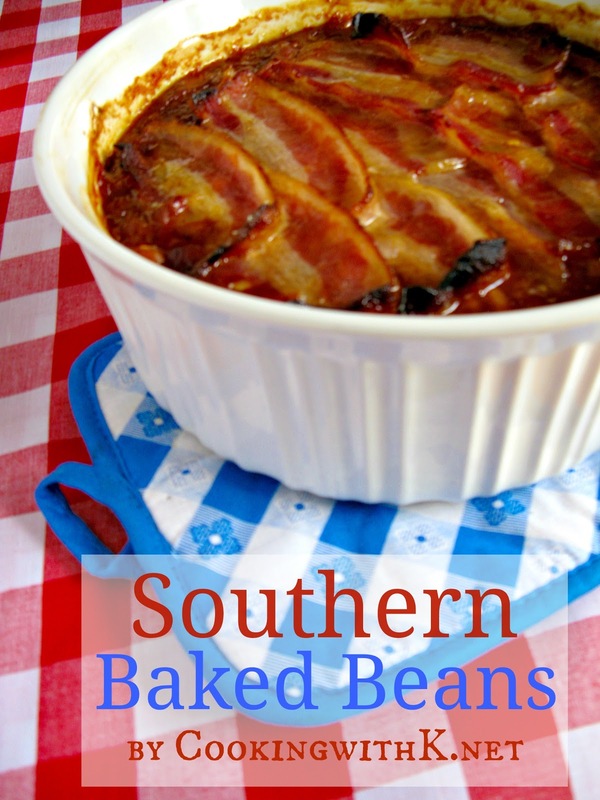 I could not post my mother's Potato Salad recipe without posting her Southern Baked Beans recipe also. Like the potato salad recipe, I have had this one in my head for years too. I watched my mother make her potato salad and baked beans gazillion time, and I don't remember her making one without the other, but I suspect that there were times when she did. I know what her ingredients are in her baked beans, but I am not sure about the exact amount of the ingredients each time. All I can go on is how I remember my mother's baked beans tasting. I have created the amounts to the ingredients that my family likes, and how I remember my Mother's recipe tasting. Sometimes depending on how much time I have to cook the beans, instead of cooking the bacon and then adding it to the beans, I will just lay the uncooked bacon across the top and cook with the beans. Either way, they have bacon in them which it a win-win as far as flavor. he! he! Mother always used a recipe when she did her baking, but she rarely used one when she did her cooking. 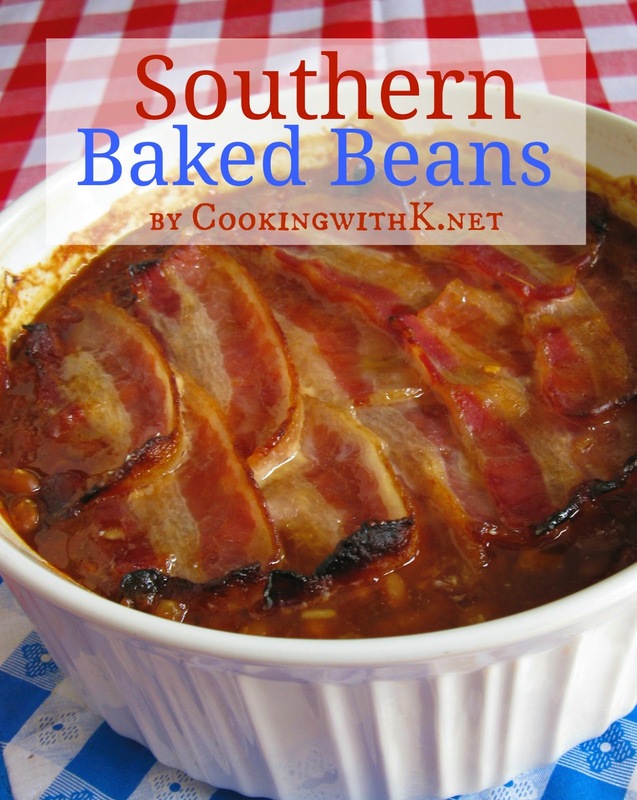 I have seen several different recipes for baked beans, but I would say that these baked beans are an all time classic recipe that is from the time when my mother began cooking in the 40's and 50's. Life was simple and delicious, just like these baked beans are. Hope you get to make some for your gatherings soon. Enjoy! Preheat oven 375 degrees F. In a large mixing bowl, combine pork n' beans, onion, bell pepper, brown sugar, ketchup, Worcestershire sauce and mustard. Add bacon pieces across the top. Bake for 35-40 minutes. Cook's Note: The brown sugar can be adjusted to more or less depending on how sweet you like your beans. We like ours sweet. Judging on how many servings you will need, this recipe may be adjusted to a half recipe or increased to double the recipe. Sometimes, I just mix the bacon in with the beans instead of just on the top. This post maybe link to Link Party Palooza, Weekend Potluck, Two Cup Tuesday, Wednesday Whatsits, Foodie Friday, Freedom Friday, Super Satuday, Inspiration Exchange, The SITS, Whimsy Wednesday and all these fabulous parties! Your recipe reminds me of when my Mom ( and Grandma ) used to make Baked Beans and Potato Salad together, and it was my Favorite!!! Still is.. Thanks for your recipe! Pinned! Thank you Melissa! Baked Beans and Potato Salad just go together like two peas in a pod…giggles!